Città della Scienza > News > HAPPY BIRTHDAY…CITTÀ DELLA SCIENZA! 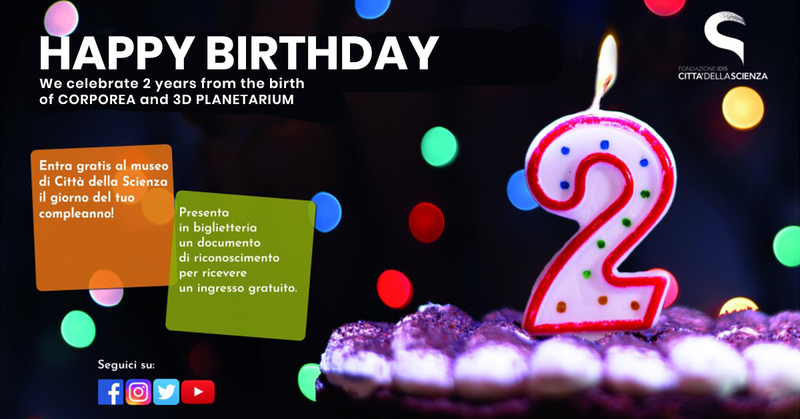 Città della Scienza gfts you a special birthday! March is the month of “important birthdays” here in Città della Scienza. On March 4th and 19th, 2017, Corporea museum and Planetarium 3D days have been inaugurated and this year we have decided to celebrate it with you. “Happy Birthday in Città della Scienza” is the initiative that our museum offers visitors to celebrate a very important moment together. If you were born in March do not miss this opportunity, present your identification document at the ticket office and enjoy a unique experience.